Thanks to our roving reporter Ryan for another excellent update. Will we be seeing how the Nigerian Plan carrying Eko’s brother Yemmi crash on the Island? 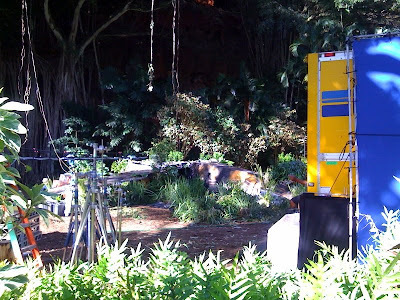 The “LOST” production crew returned to the North Shore of Oahu this afternoon, setting up near Waimea Falls mauka of Waimea Bay. Will we be seeing another backstory of a disastrous island arrival? And if so, whose? You can see a couple more photos at Ryan’s site here.